If Yoga, Meditation and Weightlifting had an illegitimate child – it would be The Happy Body Program. This simple, pleasurable daily routine fuses mantra-based meditation and flexibility focused strength training. With 3 sequences of 6 movements you seek to master over the course of a year (or a lifetime), not week, a month or 6 minutes like other programs promise. THB is responsible, accessible, sustainable fitness laser-focused on keeping your body youthful and pain-free. Elegantly designed for smart, busy people who understand how success is built. The Happy Body brings patience, focus, joy, and vision to the Art and Science of being strong and pain-free at any age. A new daily exercise routine that will reverse the aging process. Insight and experience with THB’s meditative mantra that transforms you exercises into a moving meditation. Learn how to perform the first 3 movements of the 18 exercise system ~ gaining the confidence you need to learn the rest of the system on your own. Caring for our “Microbiome” is the Health Care of the Future. 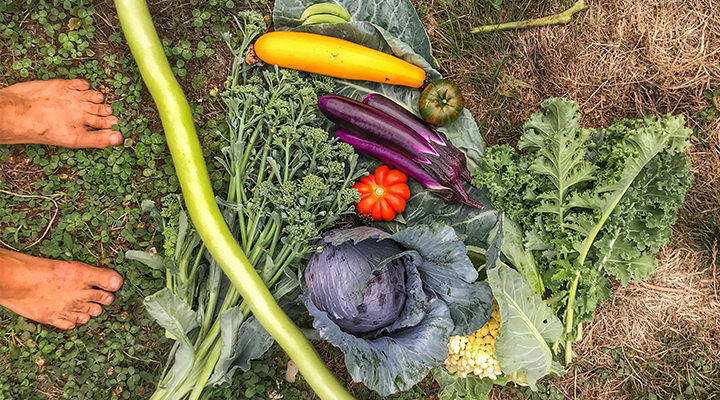 This Discussion aims to teach you what exactly your “Microbiome” is, how our current chronic disease crisis is linked to it’s decline, and what you can do cultivate a healthy for yourself and your family. People who understand they are part of an ecosystem and want to understand and harness that for greater health and happiness. See the clear link between your actions and the health of the planet. 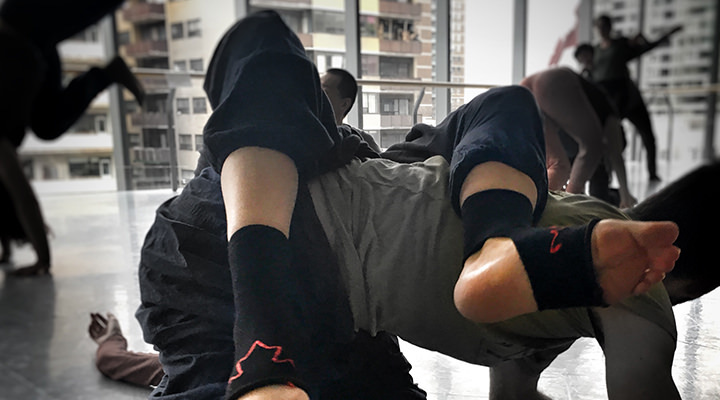 Every Easter long weekend Contact Improv takes over the National Ballet School for a weekend of Classes, Jam’s, Lab’s, Music, Food and Napping in the hallways. This year I have been asked to facilitate a peer coaching lab. It’s time to explore and integrate. To pair up with one or more people, work on what you have been learning, request to be taught something or teach something you would love to share. Anyone who wants some self-directed/Peer directed time to explore, learn, grow or teach with Contact Improvisation. Experience and appreciation for the Labbing process that was a big part of the development of contact improv. Time to request help, or explore a curiosity. Let’s get together for a Woman-Only Contact and Live Music Jam. Just because woman coming together is a powerful thing the planet needs more of! Woman interested in, or experienced with Contact Improvisation. 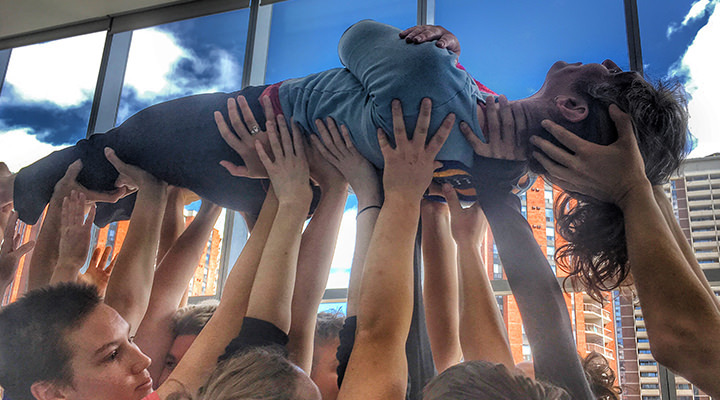 Strength Pirates: Hijacking traditional Strength Training to serve the Art form of contact improvisation. Body weight training with someone else’s body is pretty much the coolest thing I could dream of. In a sense, that’s what Contact improvisation is. 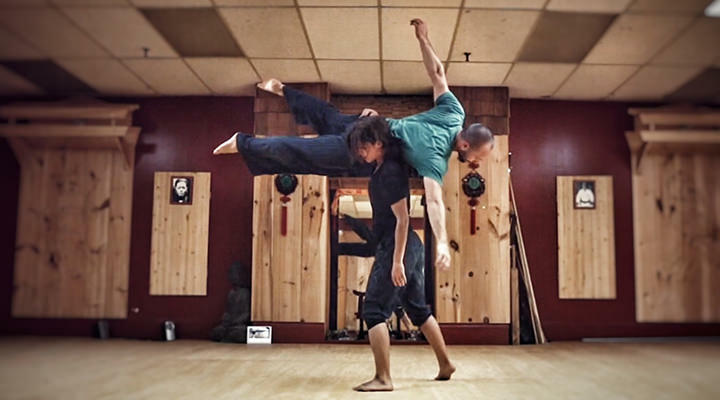 Call it Ballroom yoga, Art Wrestling, Primal Puppy Dog Play, this fusion of dance, martial arts and moving meditation is fun as heck and a fantastic way to get strong. Come along while we explore how one could apply principle of strength, speed and agility training to improve the improv. People with 6 months Contact dance Experience or a 3+ day intensive. A half an hour orientation to classical contact improvisation will be mandatory if you have been dancing less than 1 year. When in doubt reach out! Understand and MAP your current strength / flexibility limits. Experience your potential for strength. Leave with some accessible practices, both inside and outside of the dance that can help you improve your strength, flexibility and coordination. 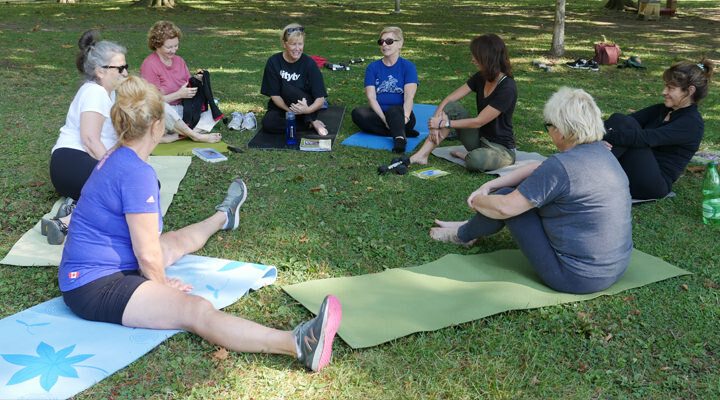 Prepare to be silly, strong and supportive in this Outdoor Fitness Club of women over 40. Together we will explore and experience how much fun getting fit outside can be in Toronto’s Beach Community. Designed for people who like the outdoors at least a little, and don’t think the ground is “gross”. Women and Non-Binary folk who’s knees, backs and shoulders can usually handle mild to light moderate exercise without pain or discomfort lasting more than a day. (If this is not you, please book a call with me to talk about The Happy Body Program so we get you better) . Friends, play, smart movements that make you a more capable person. Support, celebration and a loving kick in the rear now and then from a group of people that care. Use this to select the event and quantity of attendees. What are you most excited to get out of the workshop?